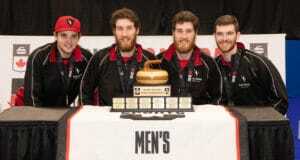 The North Americans, who have been trounced so far in the four-day global curling slugfest, managed to tread water a bit, salvaging a split in points in the afternoon Men’s Team Scramble, a new wrinkle added to this year’s schedule at the Orleans Arena in Las Vegas. The North Americans won one game, Team World another, and they settled for a tie in the third matchup. 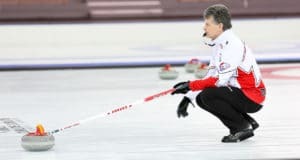 The points, meagre as they were for Team North America, helped somewhat offset the morning results where Team World captured 2.5 out of the three available points in Women’s Team Scramble to stretch their lead and close in on the 30.5 points needed to close the deal and snap a six-year winless streak. Team World remains in the driver’s seat, leading 17.5-6.5 in points. Team Scramble and Mixed Team Play events put an emphasis on how curlers can perform with teammates they’d regularly play as opponents. In the team scramble, men’s and women’s teams are mixed to form new same-gender lineups. The North Americans got a good effort from Calgary skip Kevin Koe who registered a nifty 7-3 win over young Bruce Mouat of Scotland. Koe, supported by U.S. third Chris Plys, second Brett Gallant (St. John’s, N.L.) and lead Ben Hebert (Chestermere, Alta.) cracked two three-enders, one of them coming in the fifth end. Koe acknowledged that it’s still a long uphill battle for Team North America, but there is a light at the end of the tunnel. There is a Mixed Team Play draw slated for Saturday evening, and each game is worth two points, double the amount that has been awarded in the other disciplines so far. And, of course, there are the 30 points available in the five Skins matches that close out the competition Sunday. Peter de Cruz picked up the Team World win. de Cruz throws second stones but skips, and together with Swiss teammate Benoît Schwarz, who throws skip stones, and a pair of Swedes, third Oskar Eriksson and lead Christoffer Sundgren, the Europeans overwhelmed American skip John Shuster and his Team North America side 6-2. 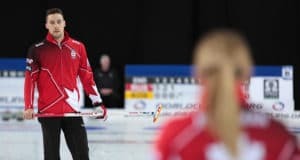 The third afternoon match ended in a 4-4 tie between Team North America’s Brad Gushue of St. John’s, and Team World’s Niklas Edin, two heavyweights in world curling. Gushue was supported by third B.J. Neufeld (Winnipeg) Matt Hamilton of the U.S. and lead Geoff Walker (Edmonton). Edin needed a draw to the button with his final rock of the eighth end to secure the tie. Play resumes tonight with the Mixed Team Play at 6:30 p.m. (PST).